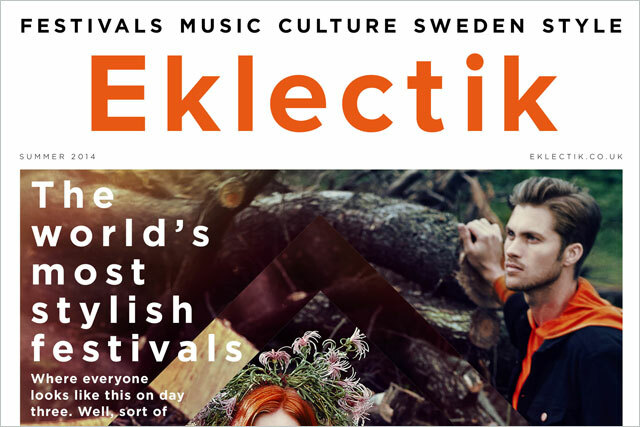 Kopparberg, the Swedish cider brand, has teamed up with the publisher of Stylist and ShortList magazines to create Eklectik, a one-off magazine with 400,000 copies to be distributed next week. Eklectik is funded with a £400,000 spend from Kopparberg, representing the brand’s biggest single media investment to date. The 36-page magazine has been created by a combined editorial team from ShortList Media, which owns ShortList and Stylist, and ShortList’s features editor, Jimi Famurewa, edited it. Its articles are themed around a Scandinavian outdoor lifestyle, promoting the talent and culture of Kopparberg’s native Sweden. It includes pieces on bars and festivals, food, adventure and Swedish fashion. Around 400,000 free copies of Eklectik will be given out with ShortList and Stylist magazines from 10 to 12 June in London, Manchester and Glasgow. An additional 50,000 copies will be given out at festivals and bars where Kopparberg has a presence, throughout the summer. The magazine is initially a one-off project, but could be published more regularly. From next Tuesday 10 June, the website eklectik.co.uk will continue to be updated with new content from ShortList and Kopparberg for three months. It carries print ads from two Swedish brands, including sock company Happy Socks. Rob Calder, the head of marketing at Kopparberg, said: "We don’t have the budgets of some of our more established competitors and it's vital that our investment goes the extra mile. "Eklectik captures the passions of our brand and our consumers, but it also embodies the entrepreneurial ethos of our business. As a group, we have turned this idea around inside three months and our partners have ensured a very enjoyable process." The £400,000 deal also includes Kopparberg ads in ShortList and Stylist, on their websites and digital brands Mr Hyde and Emerald Street, and cover wraps of both magazines. Darren Sital-Singh, the publisher of ShortList and Eklectik, said Eklectik marked its "first foray into custom publishing". Sital-Singh said: "This hugely ambitious project not only enhances our reputation as one of the most innovative and creative publishing houses but, more importantly, further strengthens the reputation and influence of the free distribution mode." "None of this could have been achieved without Kopparberg’s belief in our brands, editorial integrity and the engaged relationship we have with our audience of young, urban and upmarket professional men and women." Goodstuff Communications, Kopparberg’s media agency, devised the concept for its pitch to win the account in January. The agency then briefed Shortlist Media on the concept, and has extended the concept across digital, outdoor and social media. Sam Drake, a business director at Goodstuff, said: "We cannot wait to see Eklectik hit the streets next week. It’s been a huge undertaking for everyone involved, and a big thank you has to go to ShortList Media in bringing the magazine to life. "The quality is fantastic, and everyone at Goodstuff will be raising a glass of Kopparberg to celebrate next week." Is 'beer for women' a viable concept?